Ulaanbaatar, January 25 (MONTSAME) According to the Minister of Finance, the International Monetary Fund (IMF) mission will probably resume their activity in Ulaanbaatar on the negotiation of Stand-By Arrangement sometime this week. Mongolia officially requested financial aid from IMF on September 30, 2016. The representatives of IMF came to Mongolia on the request, having met with the heads of Bank of Mongolia, Ministry of Finance and corresponding Parliamentary standing committees. The mission revisited last month to negotiate on the Stand-By program, but delayed due to public holidays. Therefore, the next potential meeting is projected to discuss the guidance on which IMF program needs to be implemented, and what changes are needed in Mongolia. Whether if Mongolia will be included in the Stand-By arrangement or not would be made clear in this meeting, along with the initial amounts of loan. After their previous visit, Minister of Finance B.Choijilsuren said "The Stand-By program can be launched before the Lunar New Year". Also, the Minister of Foreign Affairs noted in his interview for Bloomberg Mongolia "The Government is planning to settle the negotiation for the Stand-by program with IMF by February". The reason behind the rushed talks before the Tsagaan Sar or the Lunar New Year, which will be observed late February is the expected payment of USD 580 million of Development Bank bonds due in March. Although the exact amount is unclear, the first deputy governor of the central bank, O.Erdembileg said during the discussion on the state guidelines on monetary policy for 2017 held in October 2016, "Around USD 400 million loan will be available with the Stand-By program. The Government is negotiating for other sources for investment". Even if the government successfully negotiates with IMF on Stand-By program, there's probably still a need of other investment sources to repay its debts. The Finance Minister said that the initial plan to pay the USD 580 million notes is yet to be released. Headline Figure . 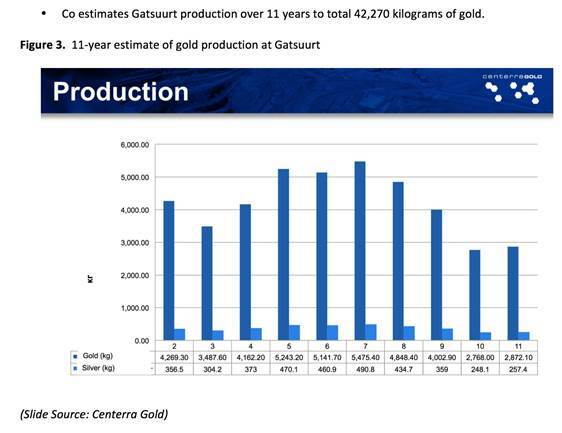 11-year estimation of gold production at Gatsuurt. Taskforce to negotiate Investment Agreement and Deposit Mining Agreement with Centerra Gold, possessor of license to mine Gatsuurt gold hard rock deposit of strategic significance, is to be established. It has been decided by Cabinet Meeting that relevant Parliament Standing Committees will be introduced that special royalties to replace 34% state stake at Gatsuurt deposit will not be less than 3%. GoM also reviewed that Gatsuurt has been enrolled as deposit with strategic significance on Jan.23rd of 2015. On Feb.4 of 2016 Parliament authorised GoM's stake to be 34%. Since the Feb. resolution taskforce to negotiate Investment Agreement established by order of Prime Minister has been negotiating with investor but negotiations have been entered stagnation. Bank of Mongolia(BoM) has stated that it had record purchases of 18,308 kgs of gold in 2016, which is 21.3% increase y-o-y. I estimate that purchases are worth approximately US$732m. This is equal to 56% of Nov. FX reserves of US$1.3b on cumulative basis, noting also that purchases, exports, gold monetisation and FX supply to the market by the bank are all flow processes. Separately, National Statistic Office of Mongolia (NSO) reports that gold production in 2016 was 18,435 kg. Gold exports surged 1.8x by value y-o-y to US758m in 2016 , according to NSO. ~70% of gold exports went to UK, 30% went to Switzerland, highlighting that gold exports are strategic diversification in Mongolian commodities exports as compared to 80% of exports and 32% of imports to and from China. Gold exports were 15.4% of total exports of US$4.92b in 2016. For me, as a Mongolian investor, gold is a good proxy for global, external environment sentiment. It's a global safe haven not affected by Mongolia -specific factors and performs well during global uncertainty. Good gold performance suggests investors are hedging for global political and economic uncertainty as President Trump started implementing his populist promises and Brexit process continue to evolve. Bloomberg reports that gold futures rose to the highest since November. World Bank's Development Prospects Group in its latest January Commodity Market Outlook expects gold prices "to decline 8 percent on weak investment demand" in 2017. Then Bank views that "downside risks to the forecast are stronger economic growth and faster than expected increases in U.S. interest rates. Upside risks include geopolitical tensions, stronger demand in China and India, delayed rates hikes, and mine supply shortfall." The Bank expects gold price to be US$1,150 for 2017, US$1,138 for 2018, US$1,129 for 2019, US$1,114 for 2020, US$1,055 in 2025, US$1,000 in 2030. Natural resources investment bank Argonaut Securities forecasts gold price at US$1,350 in 2017, US$1,325 in 2018 and long term price to be US$1,250. BMO sees gold price in 2017 at $1,175. Gold-2 program, part of Economic Recovery Plan to increase mineral gold reserves and gold production, being approved by Cabinet Meeting, will be implemented in 2 stages will 2020 ( 2017-2018 and 2019-2020) and it is possible to increase gold extraction by 2-3 tons per year and have production reach 25 tons by 2020. GoM views it is possible by implementing the program to collect MNT33-59b per year in form of gold royalties to state budget and, as a result of geological, prospecting and exploration work to increase prepared for state mineral gold reserves by 100-150 tons. Ernst and Young seems to have estimated that Mongolia's top 15 deposits( including OT) contain US$62b worth of gold at current market prices. I understand that company repositioned itself for high growth projects, particularly in Canada. Sadly, Mongolia/Gatsuurt represents small % of co's valuation as company's focus has been high growth projects in other jurisdictions. Mongolian assets constitute 8% of Pro-forma Asset NAV. Gatsuurt has been in C&M since 2010 or for 6 years now. In 2016, not much happened at Gatsuurt. Gatsuurt is major part of GoM's Economic Recovery Plan as one of the very few "ready-to-shovel " high-profile major projects with various major direct and indirect benefits to Mongolia. 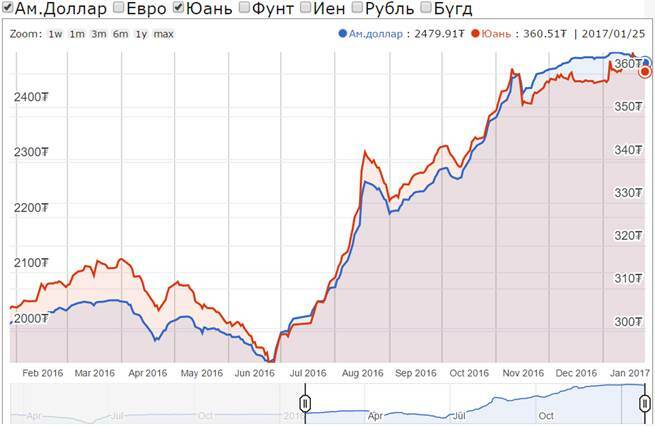 · Delay of ~US$450,000 worth of gold(foreign exchange) reserves of the Bank of Mongolia. · Delay of ~MNT250m tax revenues to state budget. I estimate that if Gatsuurt deal was signed in May of 2015 at the same time as OT Underground Development Plan, gold sales to Bank of Mongolia would have been more than 20 tons in 2016 and increased by 4 tons in 2017! Centerra Gold Inc. announced that 2016 consolidated gold production totalled 598,677 ounces of gold ( 18,247 kg) including gold production from the Mount Milligan mine in Canada. This includes 550,960 ounces of gold from the Kumtor mine, located in the Kyrgyz Republic and 47,717 ounces of gold from the Mount Milligan mine. For the time being, co plans the Mongolian operations to continue with care and maintenance activities at the Boroo mine mainly focusing on reclamation work. Any revenue from Boroo gold production from the rinsing of the heap leach pad will be offset against care and maintenance costs. The current 2017 production forecast assumes no gold production from Boroo and Gatsuurt. Company expects to incur sustaining capital and growth capital expenditures of $5 million which covers costs for additional studies and capitalized project support and administration costs related to the Gatsuurt Project. 2016 has been obviously very good year for Mongolian gold producers, which enjoyed 2.5% gold royalty, good gold price, 25% appreciation of USD and deflation in 2016. Except Centerra Gold Mongolia because Gatsuurt continued to be still stuck. Finally, after GoM's "turtle speed" on Gatsuurt section of its Economic Recovery Plan in 2016, there is some new movement. At this point, even "turtle speed" step is good news compared to no steps at all. I remain optimistic on Gatsuurt, I think GoM will finally move Gatsuurt in 2017 because it needs to recover economy , attract FDI and increase FX reserves. I expect 2017 to be another very good year for other Mongolian gold producers. I also think Centerra Gold is good global diversification for portfolio of Mongolian investors. January 25 -- This announcement is made by SouthGobi Resources Ltd. (the "Company") pursuant to Rule 13.09 of the Rules Governing the Listing of Securities on the Stock Exchange and the Inside Information Provisions under Part XIVA of the Securities and Futures Ordinance (Chapter 571 of the Laws of Hong Kong). Reference is made to the Company's announcement dated January 20, 2017 in relation to the receipt of lawsuit notice from a fuel supplier. The Company announces that the Khan-Uul District Civil Court of First Instance in Mongolia (the "Court") has dismissed the litigation raised by Magnai Trade LLC ("MT") against SouthGobi Sands LLC ("SGS"), a subsidiary of the Company, in relation to a claim of MNT 22.2 billion (approximately US$ 8.9 million) on the basis that if the dispute cannot be amicably resolved, it must be settled by arbitration in Mongolia, rather than litigation, in accordance with the express provisions of the fuel supply agreement between SGS and MT. The Company values its business relationship with MT and will continue to resolve the dispute with MT through continuing business discussions, or through arbitration if a resolution cannot be reached. January 25 (Bank of Mongolia) Auction for 39 weeks maturity Government Treasury bill was announced at face value of 80.0 billion MNT. Face value of 20.0 billion /out of 20.0 billion bid/ Government Treasury bill was sold at discounted price and with weighted average yield of 18.000 %. January 25 (Bank of Mongolia) Auction for 3 years maturity Government Treasury note was announced at face value of 5.0 billion MNT. Government Treasury bill was not sold due to absence of both competitive and non-competitive bids. Ulaanbaatar, January 25 (MONTSAME) Last year, Mongolia exported USD 758.4 million worth of gold. According to National Statistical Office of Mongolia (NSO), 69.7 percent were exported to UK, 30.2 percent to Switzerland and the rest were exported to Nepal. With the total volume of 19.2 tons, the export rate increased by 70 percent since 2015. Due to the policy to increase gold reserves held by the Bank of Mongolia, the Central Bank made decision to buy gold with London Metal Exchange (LME) rate. Previous rate was at USD 2 lower than LME. According to Mongol Bank, the submission rate of Central Bank hit the all time highest 17.6 tons in November of last year. On the other hand, the Government implemented "Gold-2" national program to increase gold mining. "Gold-2" program will be implemented with stages until 2020 to restore the economy and to increase the volume by 2-3 tons per year and reaching 25 tons by 2020. Also, according to the government, it's possible to increase the budget by approximately MNT 33-59 million per year as a royalty and the gold reserve ready for use by 100-150 tons after geological surveys. 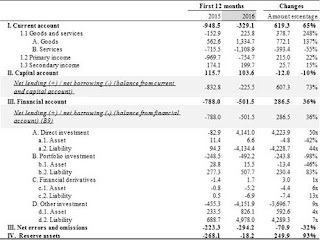 Current and Capital account balance totaled to $225.5 million deficit which is 73% or $607.3 million decline compared to the same period of the previous year. 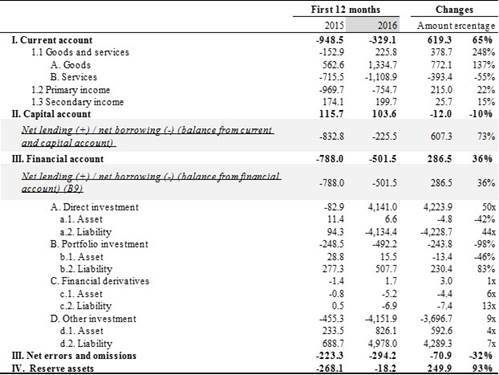 The change was due to decrease by $378.7 million or 248% in goods and services account creating surplus of $225.8 million, and decrease by $215 million or 22% in income account creating deficit of $754.7 million. Financial account had a surplus of $501.5 million which is declined by $286.5 million or 36% compared to the same period of the last year. According to the interpretation of 6th edition of Balance of Payments manual, Mongolia has a net borrowing during this period. As of the first 12 months of 2016, overall balance of payment deficit was $18.2 million, net error and omissions was -$294.2 million. January 24 (Mongolian Economy) The Bank of Mongolia (BoM) held its first press conference of the year yesterday to answers to journalists' questions. Beginning with data on the past year, the BoM noted that as of the end of December 2016, inflation in Mongolia stood at 1.1 percent nationwide and 0.5 percent in Ulaanbaatar. Rises in the price of meat and vegetables were the main factor for the figure for the capital city. As for interest rate indicators, the weighted average interest rate for MNT loans was at 19.7 percent, savings weighted average interest rate 13.1 percent, policy interest rate 14 percent and inter-bank lending rate 15.5 percent. According to the BoM, the central bank's securities balance is MNT 578 billion, and foreign exchange auctions amount USD 189 million. Money supply reached MNT 12.075 trillion, which is an increase of MNT 2 trillion from the same period of the previous year. 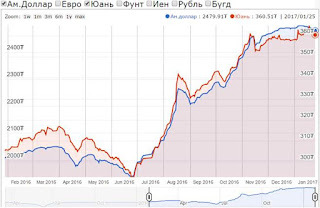 According to the review of the monetary situation, Mongolia's foreign trade balance showed a surplus of MNT 1.559 billion at the end of last year, and total export amounted to USD 4.9 million and imports to USD 3.36 million, with China the destination of 79 percent of exports and Russia 1.1 percent. After the statistical news, the head of the Monetary Policy Department of the BoM answered journalists' questions. "Monetary policy is determined depending on the current domestic and external economic and market conditions. Therefore, it is not possible for us to predict the conditions of the exchange market. According to the recent economic growth outlook, we will implement the monetary policy towards supporting the economy as the economic growth has declined and inflation is relatively low," said N.Urgamalsuvd regarding monetary policy in 2017. The BoM says that the US dollar exchange rate has been stable since the beginning of this year due to the increased foreign exchange flows. The pressure on the currency market has decreased with net flows of USD 28 million. The sharp depreciation of the tugrik last year was due to the activities of currency traders, says the BoM. Therefore, they established a working group tasked with creating domestic market infrastructure, or in other words, a currency market platform. It will take about 1-2 years. The "Gold-2" programme is one of the works the BoM will carry out in 2017. This programme will be implemented in five areas over two phases: 2017-2018 and 2018-2020. Last year, 28 tonnes of gold was turned over to the BoM, and it is expected that more gold will be submitted in 2017. Furthermore, the BoM said that they cannot provide detailed information regarding the extension of the swap agreement with the Chinese government and loan negotiations with the IMF since both negotiations are on-going. "Prices for most commodities appear to have bottomed out last year and are on track to climb in 2017," said John Baffes, Senior Economist and lead author of theCommodity Markets Outlook. "However, changes in policies could alter this path." "Investment weakness – both public and private – hinders a range of activity in commodity-exporting emerging market and developing economies," said Ayhan Kose, Director of the World Bank's Development Prospects Group. "Most of these economies have limited policy space to counteract the slowdown in investment growth, so they need to employ measures to enhance the business environment, promote economic diversification, and improve governance to better growth prospects over the longer term." The World Bank's Commodity Markets Outlook is published quarterly, in January, April, July and October. The report provides detailed market analysis for major commodity groups, including energy, metals, agriculture, precious metals and fertilizers. 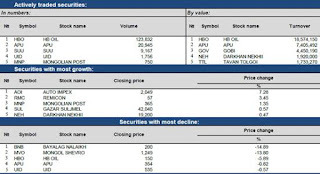 This edition extends price forecasts to 2030 for 46 commodities and provides historical price data. January 25 (MarketWatch) LONDON--Copper prices pulled back from a 19-month high Wednesday, but the threat of strike action at the world's largest copper mine helped limit the metal's slide. The three-month London Metal Exchange copper contract was down 0.71% at $5,903.50 per metric ton during midmorning European trade, after starting the day in positive territory. On Tuesday, the metal closed at the highest price since mid-June 2015, pushed higher by the threat of a strike at the Escondida mine in Chile, owned by BHP Billiton Ltd. and expectations that the Trump administration's infrastructure pledges will increase demand. Concerns on Wednesday about the threat of a supply disruption were helping support copper, which registered smaller losses in the morning than the other base metals, said Daniel Briesemann, an analyst at Commerzbank. The Escondida mine produces about 5% of the world's copper output. But Liz Grant, at metals broker Sucden, said the metals on Wednesday "have run out of momentum." It is unclear whether the sea of red across the base metals complex represents a momentary pullback, or the correction many analysts say they have been waiting for. "The higher prices [in the copper market] are not justified," said Daniel Briesemann, an analyst at Commerzbank. Since the beginning of the year, copper has risen more than 7%, and over the last three months, the metal has gained nearly 25%. Aluminum, lead and zinc have also seen large gains in the three weeks since 2017 began. Concerns about production disruptions in Chile and elsewhere have helped copper rise, but the bulk of those gains have been due to a speculative appetite for the metal, fueled by expectations that a Trump presidency will dramatically boost infrastructure spending, according to analysts. Those comments have helped improve the overall business sentiment and comes amid a backdrop of infrastructure investment in other countries, analysts say. But many have cautioned that even if those policies do come, the impact for base metals may be muted. The U.S. makes up less than 15% of global copper demand, compared with China, which makes up nearly half of the world's demand. Infrastructure projects in the U.S. are likely to be more bullish for key building materials like steel and iron ore, Ms. Grant said. Meanwhile, China is largely out of the market this week ahead of the Chinese New Year holidays. The other base metals were all lower on Tuesday. Aluminum was down 1.34% at $1,841 per metric ton, lead was down 1.34% at $2,350 per ton, zinc was down 1.82% at $2,778 per ton, nickel was down 2.39% at $9,590 per ton, and tin was down 0.49% at $20,500 per ton. January 25 (Reuters) Gold prices fell on Wednesday as renewed hopes that U.S. President Donald Trump will unleash growth-friendly spending policies boosted shares and eroded bullion's safe haven attraction. Spot gold had fallen 0.4 percent to $1,204.21 per ounce by 1122 GMT while U.S. gold futures shed 0.6 percent to $1,204. Investors turned their attention to world stocks, which hit a 19-month high, lifted by strong Japanese trade data, stellar European company earnings and hopes that Trump will press ahead with a large fiscal spending package. "The combination of higher bond yields and higher stocks are outweighing the marginally weaker U.S. dollar and in turn is causing the loss in gold today," said Carsten Menke, research analyst at Julius Baer in Switzerland. Moves by Trump on oil pipeline projects on Tuesday boosted U.S. equity markets and weighed on the dollar index, which was down 0.3 percent at 100.03 on Wednesday morning after having slipped below 100 for the first time since early December. A softer dollar makes commodities priced in the U.S. currency cheaper for buyers using other currencies and usually boosts gold. Menke, who expects the dollar to rebound and pressure gold in coming weeks, has pegged a three-month price target of $1,075. "We also have an improving local growth backdrop, which does not bode well for safe haven demand, so we would expect outflows from the physically-backed products to resume and to put further pressure on gold," he added. Holdings of SPDR Gold Trust, the world's largest gold-backed exchange-traded fund, fell 0.37 percent to 804.11 tonnes on Tuesday from 807.07 tonnes on Monday. Gold hit two-month highs earlier in the week and has rallied about 8 percent since mid-December, fueled by worries over Trump's policies. Gold is often seen as a safe-haven investment in times of geopolitical and financial uncertainty. Gold may also be pressured due to lower demand linked to China's Lunar New Year festival which begins on Friday, traders said. "(Gold was) unable to capitalize on a softer dollar with Chinese physical demand beginning to wane as we head ever closer to the New Year holiday period," MKS PAMP Group trader Sam Laughlin said in a note. "Gold prices have moved higher since the beginning of the year and need some technical correction in the very short-term," said Jiang Shu, chief analyst at Shandong Gold Group, adding gold might test $1,185 during the Lunar New Year. Silver dropped 1.1 percent to $16.90. Platinum fell 0.6 percent to $989.74, after hitting its highest since Nov. 10 in the previous session. Palladium shed 0.6 percent to $781.60. It had marked its strongest in more than 1-1/2 years the day before. January 25 (Bloomberg) Iron ore just won't back down. Prices are near the highest in more than two years as speculation of sustained Chinese demand for imports outweighs repeated warnings from analysts that the rally is overextended and will unravel. "The latest price gains are not sustainable," said Caroline Bain, chief commodities economist at Capital Economics Ltd., describing the recent advance as very speculative in nature. "It seems likely that it is premised on optimism about demand after the new year holiday," she said in an e-mail, referring to the Lunar New Year which falls at the end of this week. The raw material surged last year as stimulus in China supported steel production, buttressing record demand for imports as local mine output fell. Citigroup Inc. has said part of the explanation for recent strength may lie in a shortage of higher-quality ore, which has been hard to come by even as overall seaborne supplies rise. Among those sounding warnings about weaker prices over 2017 are the World Bank and Goldman Sachs Group Inc.
"New low-cost capacity is expected online this year, notably Vale's new S11D project in Brazil," the World Bank said in its quarterly Commodity Markets Outlook, which was released on Tuesday. "These considerations, along with rising scrap supply and an expected slowdown in China's steel production, are expected to pressure prices downward." Ore with 62 percent content in Qingdao was little changed at $82.49 a dry ton on Wednesday, according to Metal Bulletin Ltd. That's near the peak of $83.65 hit on Jan. 16, which was the highest price since October 2014. Iron ore's rally, as well as advances in base metals, has benefited miners' shares. In Australia, BHP Billiton Ltd., which reported quarterly output figures on Wednesday, rose 3.3 percent in Sydney to the highest close since 2015. Rio Tinto Group and Fortescue Metals Group Ltd. also advanced. Brazil's Vale SA is up 39 percent in 2017. Vale is bringing on S11D this year, adding to seaborne supply. In Australia, BHP, the world's biggest mining company, reported second-quarter production rose 9 percent to 60 million tons in the three months ended Dec. 31, up from 57 million a year earlier and topping the 59 million median estimate of five analysts surveyed by Bloomberg. Goldman's Jeffrey Currie, head of commodities research, told Bloomberg TV on Tuesday that he's negative on the outlook for iron ore even as prospects for most raw materials are bullish. "If we think about Brazil, Australia adding supply to the market, it'll likely put downward pressure on prices," he said. 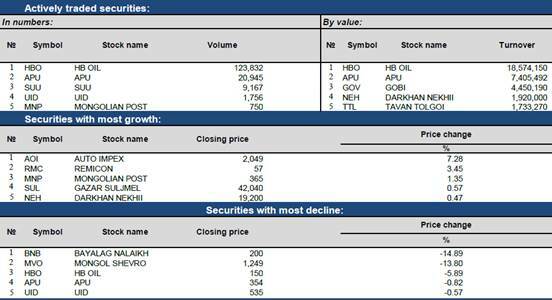 The bank's bearish view is shared by Citigroup, as well as Barclays Plc. While Citigroup has raised forecasts for the first and second quarters to $77 and $70, it's sticking with a fourth-quarter outlook for a drop to $53. Barclays has said current levels aren't sustainable as growth in China may slow, while new seaborne supply hits the market and demand for high-quality ore eases. January 25 (MarketWatch) Oil futures saw volatile Wednesday, with prices pressured by data showing a third-consecutive weekly increase in U.S. crude inventories but continuing to find some support from successful efforts by major crude producers to cut back output. March West Texas Intermediate crude CLH7, -0.24% was last up 9 cents, or 0.2%, to $53.27 a barrel on the New York Mercantile Exchange. It was trading at $52.90 before the release of U.S. government data on petroleum supplies. Prices fell immediately after the report, turned higher, then seesawed between minor losses and gains. Benchmark Brent crude for March LCOH7, -0.11% was trading flat at $55.44 a barrel on the ICE Futures exchange in London. "A crude build in line with both consensus and last night's print was already built in to expectations, and after the initial body blow of a bearishly big gasoline build, crude is finding its feet again," said Matt Smith, director of commodity research at ClipperData. The U.S. Energy Information Administration reported Wednesday an increase of 2.8 million barrels in domestic crude-oil supplies for the week ended Jan. 20. That was in line with the 2.9 million-barrel climb reported by the American Petroleum Institute late Tuesday. Analysts polled by The Wall Street Journal were looking for a rise of 2.1 million barrels, while S&P Global Platts forecast a climb of 1.9 million barrels. Gasoline supplies jumped up by 6.8 million barrels, while distillate stockpiles were "virtually unchanged" last week, according to the EIA. The S&P Global Platts survey called for a rise of only 830,000 barrels for gasoline stocks and a decline of 1.3 million barrels for distillates, which include heating oil. On Nymex, February heating oil HOG7, -1.22% fell 1.2 cents, or 0.7%, to $1.63 a gallon and February gasoline RBG7, -2.44% lost 2.8 cents, or 1.8%, to $1.548 a gallon. February natural gas NGG17, +1.40% meanwhile, edged up by 6.3 cents, or 1.9%, to $3.342 per million British thermal units, head of an EIA update on supplies of the fuel due Thursday. The EIA petroleum report, overall, was bearish, said Chris Kettenmann, chief energy strategist at Macro Risk Advisors. "Nevertheless, we believe bad is good with the Saudi put back in the market and would be buyers of the intraday pullback in crude oil." Oil prices have found support in recent weeks from plans by the Organization of the Petroleum Exporting Countries, including Saudi Arabia, and other producers to reduce output. Around 1.5 million barrels a day has already been taken out of the market from about 1.8 million barrels a day agreed by major oil companies starting on Jan. 1, energy ministers said on Sunday, as producers look to reduce oversupply. But as OPEC is cutting, U.S. production is starting to rise. Total U.S. crude output edged up by 17,000 barrels a day to 8.961 million barrels a day last week, the EIA report showed. President Donald Trump's promise to support the U.S. oil industry has encouraged analysts to raise their forecasts of growth in U.S. oil production, which is already benefiting from higher prices. A push by Republicans in the U.S. House of Representatives for a shift to border-adjusted corporate tax could help push U.S. crude prices higher than global benchmark Brent, triggering large-scale domestic production, according to Goldman Sachs. January 25 (Cover Mongolia) We were hoping to give you at least basic details of Tuesday's event where the parliament working group tasked with looking into Russian sale of Erdenet's 49% stake to Mongolian Copper Corporation declared the deal 'illegal'. Perhaps this is TDB's effort to not have its international reputation tarnished. Basically what happened was--according to my own understanding—the parliament working group introduced its findings and declared the deal was illegally done. Main 'crime' was that TDB exceeded its legal limit of loans to one entity. TDB had given several loans to associated companies, where they in turn, lent to MCC. TDB President, CEO, lawyer, and others denied this and threatened to sue the government in case they nationalized their stake. Ulaanbaatar, January 25 (MONTSAME) The Standing Committee on State Structure backed the parliamentary resolution on designating the date of the upcoming Presidential Election. The resolution suggests that voters in Mongolia will cast their ballots in the Presidential election on June 26, 2017. The Mongolian nationals, living outside the country, would register their votes on June 10 and 11. The decision will be legitimized after the approval by the State Great Khural. In the interview with MONTSAME, Chairman of the General Election Committee Ch.Sodnomtseren noted that the date of balloting is being announced in accordance with the Law on Elections, as it provides that the election date must be settled at least 150 days prior to the election. The law also provides that elections should be held in the last week of June. Pursuant to the Constitution of Mongolia, a presidential candidate must be a citizen of Mongolia, aged 45 years or more, must have lived in Mongolia for the five years to the candidature and be a member of political party that has at least one seat in the parliament. ULAANBAATAR, Mongolia, January 25 -- The American Chamber of Commerce (AmCham) in Mongolia hosted its January Monthly Meeting with His Excellency Miyegombo Enkhbold, Chairman of State Great Khural of Mongolia on January 25th, 2017, at Best Western Premier Tuushin Hotel. The Honorable Jennifer Zimdahl Galt, U.S. Ambassador to Mongolia, attended the meeting as a guest of honor. The meeting convened over 100 participants, including AmCham members, foreign ambassadors, heads of international financial institutions, leaders of foreign business groups, and representatives from the local and international private sector. Chairman M. Enkhbold provided the latest updates on the government's key legal reforms and spoke about actions to bolster private sector development and promote investment in Mongolia. AmCham had the honor of hosting the first formal engagement between the Chairman and the international business community. His Excellency M. Enkhbold commented on Mongolia's efforts to regain investor confidence and noted, "We are working to firmly maintain the stability of policy and transparent governance in law making, while strongly addressing the issue of corruption. Mongolia is also working closely with the IMF and other international donor organizations, as well as other countries – including the USA, Russia, China, and Japan – to overcome the current economic challenges in a short period of time." "The United States Embassy and AmCham are partnering with the Mongolian government in other areas to successfully transform the Mongolian business environment into one that enables long-term, sustainable economic growth. To that end, I look forward to joining the annual AmCham Mongolia and Asia-Pacific Council of American Chambers of Commerce Delegation" said the Honorable Jennifer Zimdahl Galt, the U.S. Ambassador to Mongolia, during her remarks. Chairman of AmCham Mongolia Mr. Jay Liotta said, "One of AmCham's major initiatives in 2017 is to make sure that each one of our member companies has a success story to tell the world in 2017. In other words, Mongolia's private sector businesses – small and large – need to succeed for Mongolia to succeed. AmCham and our members are both pleased and encouraged to hear the Chairman's commitment to getting Mongolia back on track." January 25 (gogo.mn) In the latest Corruption Perception Index, complied by the German-based non-governmental corruption monitor, Transparency International (TI), Mongolia has moved from 72nd to 87th place, sharing this position with Panama and Zambia. All three countries received a similar score – 38 out of 100. The CPI has been around since 1995 and measures how much corruption is perceived to exist in the public sector. The 2016 edition includes data on 176 countries and territories, each of which gets a score out of 100. The nearer to 100, the better the country is doing in its fight against corruption. Compared to the 2015 CPI, Mongolia has fell back 15 places. This indicated that the perceptions around the extent of corruption in the country are rising. TI concluded that corruption has affected a sharp decline in Mongolian economic growth. January 25 (Mongolia Focus) As readers of the blog know, I have developed an interest on Mongolia's position on various global rankings over the years. I have written about indices in methodological terms as well as to try to understand Mongolia's results. I have also become involved in formulating Mongolia's scores for a number of indices myself. Transparency International's "Corruption Perception Index" (CPI) is one of the more important global indices. Not only does it have a long track record with a respected international non-governmental organization, but it is also an index that is used as a building block for many other indices, in part because corruption is difficult to measure, and there are not many alternatives to the CPI. Before I get into methodology and an attempt to explain the change in score, it's worth noting that the movement in rank (-15) is fairly substantial, while the score hasn't changed much. The obvious interpretation of this year's CPI is thus that not much has changed in Mongolia, but a number of other countries are perceived to be less corrupt. Note that the CPI is fundamentally an aggregate score, i.e. it takes data from other rankings (that is interpreted to be related to corruption), standardizes that data on a 0-100 scale, adds it all together, and, presto!, a CPI score is born. Transparency International does provide the xls sheets of data used in the calculation so that we have a look at the data included for Mongolia. Since the score changed from 2015 to 2016, let's look at what was included with what score in those two years. In comparing the two years, let's first note the additional data point for 2016, i.e. the Freedom House Nations in Transit score. Then let's also note that there are several, relatively small changes in a number of the other scores. Scores that went down: WEF EOS (-4), BTI (-1), IMD (-2), EIU (-4). Scores that went up: Global Insight (+5), Rule of Law (+3), PRS (+1). If these are added together we get a -2 overall movement. This is then reflected in a shift in the aggregate average of these scores of 38 for 2016 and of 38.5 for 2015 (rounded to 39). This makes it very clear that the score shift from 39 to 38 is NOT particularly meaningful. If any of the component scores had been just one lower in 2015, the score would have been 38 already. Face Validity: What Happened in Mongolia in 2016? With the conclusion that the change in the score is very slight only, there really isn't that much of a point to a closer investigation of face validity in light of events in 2016. What global indices can do is provide a benchmarking against other countries and a rough tracing of longer-term trends. The 2016 CPI is another example of a year-on-year change in score that will likely be reported (I tweeted about it myself), but that should probably be ignored as it does not seem to be substantively meaningful. Ulaanbaatar, January 25 (MONTSAME) Ts.Batbayar, Deputy Minister of Environment and Tourism received a delegation led by Ayumi Konishi, Director General for East Asia Department at the Asian Development Bank and Yolanda Fernandez Lommen, Country Director, ADB Mongolia. At the meeting, the dignitaries exchanged views on projects and programs, which will be co-implemented in areas of environment and tourism in the next three years with the funding of grant aid and soft loans. Ayumi Konishi is paying a visit to Mongolia with an aim to monitor the process of ADB projects in Mongolia and develop a partnership strategy to implement in 2017-2020. ADB is one of the biggest donor organizations of Mongolia and renders soft loan, grant aid and technical assistance worth USD 300 million every year. Ulaanbaatar, January 25 (MONTSAME) "The cooperation between the Government of Mongolia and UNICEF during the period 2012-2016 has brought many results", said Roberto Benes, UNICEF Representative to Mongolia to reporters at a meeting to discuss the results of 2012-2016 cooperation between Mongolian Government and UNICEF, which is taking place in Shangri-La Hotel today, January 25. "Today, children are better off than in 2012 in number of key areas, especially in the two geographic areas Khuvsgul and Nalaikh; with provided access to kindergarten, water and sanitation in schools, but also better opportunities for children when it comes to their health and immunization. Together with these results at local level, we have important progress on national level. I want to thank the Mongolian Government for their commitment especially in improving legislations and policies", he noted. The meeting's first session was dedicated to discussing 2016 results and lessons learnt. The outcome of UNICEF's activities last year was outlined in four sections – social policy, media and partnership, child friendly community and child friendly school. The second session focused on cycle-wide review of progress: main achievements, opportunities and lessons learnt. The discussion was on the UNICEF's progress at the national and sub-national level, progress on data, knowledge and partnership and financial utilization. The last session was themed 'The bridge to the new cycle and key features of the new country programme document', and the expected outcome of the new programme was introduced. "By learning from the lessons from the past, we want to improve our service to children of Mongolia in the future. That's why we are discussing the next five years today", Mr. Benes said. He continued, "It is very important that we increase our efforts to address inequality which prevent Mongolian children from unlocking their fantastic potentials. So, we are targeting equalities in health, education, access to water and sanitation and nutrition, but also, at the same time will invest our efforts and support in those areas where the return of investment is the highest such as early childhood education, the first five years when the brain has the highest capacity of potential and development, adolescence health and child protection. These are all areas we will focus on in the next five years, increasing our support to the Government of Mongolia; and by doing so, serving children in the best possible way". "One important way to address inequality is to replicate at the larger scale. Today, we can say we know what works for children and the solutions to children problems because we tested these in the last couple of years. And now we will replicate our success at the larger scale in new five geographic areas". "I am very happy to say that our funding for 2017-2021 has slightly increased which is a result of successful fund raising and the good performance of Mongolian Government and UNICEF. The tentative total budget for the programmes of next five years is about USD 26 million, and Mr. Benes said that he was happy to confirm an increase in budget than the previous cycle. January 25 (Mongolian Economy) People look back at what they have done and how to live and work in the future on New Year's Eve. As I was doing just that, I stumbled upon an article on the website unread. Today titled "What needs to be taken into account in setting a New Year's resolution?" It reminded readers that according to one study, 88 percent of the people who set New Year's resolutions do no fully achieve their goals. In order not to be included in the list of the "failed," you should adhere to just four simple rules. First, do not set many goals. Second, do not set general and unmeasurable goals. Third, share your goals with others. Fourth, just do it. That is it. Following this specific piece of advice, not just individuals but the entire country can reach its development goals. Success is achieved by defining long-term development goals and striving towards them, regardless of whether it is a country, company, family or an individual. We call such people someone with a vision. Experienced companies determine their vision and mission from the beginning and set achievement goals. So, does Mongolia have a vision and a mission? The Comprehensive National Development Strategy most likely failed because it had far too many goals and sub-goals. Not just the average citizen, but even government authorities could not understand or implement such many goals. The Long-term Concept of Sustainable Development adopted in 2016 does not have so many messy goals. It clearly states, "By 2030, Mongolia will become a country with a stable, democratic governance; reach the status of middle-income country by per capita income; have many sustainable, growing economic sectors with a dominant middle and upper-middle class; and be a country which preserves ecological sustainability." Within this framework, it has defined a total of 45 goals, ten times fewer goals than the Comprehensive National Development Strategy. In other words, it meets the first criterion for achieving goals. Even so, can it be the concept that will get the Mongolian people on the same page and help us reach the top? Well, it is supposed to at least. Despite all that, Mongolia has more than 400 development plans if we include the plans of the national government, ministries, agencies, capital city administration, districts, provinces and soums, which are completely uncoordinated. Everyone thinks that their plan is the most important, and furthermore, implementation will depend directly on which political party or person is in power. Mongolian politicians and authorities have the bad habit of wrecking all the works, policies and decisions of the previous government. There is no such thing as continuity of state policy. Everyone understood that we can only move forward by putting an end to this problem, and so the Law on Development Policy and Planning was developed at the end of 2015. Accordingly, the Long-term Concept of Sustainable Development should be the national vision and route of development. Mongolia will reach its goals by 2030 only if the plans and activities of all the governmental organisations, political parties and authorities are carried out in a coordinated way under this general path. Phrases such as "develop, improve and create a favourable environment" may sound nice, but when it comes to measuring performance, it becomes impossible. Since the Comprehensive National Development Strategy was full of such wording, it created confusion and failed to implement in the end. It is a good thing that the Long-term Concept of Sustainable Development clearly indicates specific parameters to accomplish by 2030. For example, clearly defined goals include raising the gross national income (GNI) per capita to USD 17,500; keeping average economic growth no less than 6.6 percent; getting 80 percent of the total population into middle and upper-middle class; and increasing average life expectancy to 78 years. In addition, it includes a goal to improve Mongolia's ranking in the UNDP's Human Development Index to be in the top 70 of countries from the current 90th place out of 188 countries. Hence, it has become easier to assess whether we are reaching the goals set. For example, we have talked about improving the business environment and competitiveness for many years. Yet, it was unclear how to gauge whether it is improving. With the new national strategy, it has become possible assess it by 2030, as the concept states Mongolia aims to be "in the first 40 of 'Doing Business' indicators and one of the top 70 countries by competitiveness indicators." In other words, it is possible to review progress by seeing the results of the Doing Business Report and Global Competitiveness Index, which are updated annually. There is not a single American or even Mongolian person who has not heard of the "American Dream." This phrase pops up in books, movies, songs and just about everywhere. A person can achieve anything if he or she works hard. America's mission is to provide everyone with an equal opportunity to make their dreams a reality. So, do we have a Mongolian dream, basic mission of Mongolia or any goals? The plan is that Mongolia's Long-term Concept of Sustainable Development is to be implemented in three main phases: 2016-2020, 2021-2025 and 2026-2030. We are already one year into the first phase. However, do the Mongolian people, and the state authorities and officials in particular, know about it? The first step should be to relay the message to every Mongolian citizen that our country now has this kind of vision and that we need to work to accomplish it. Only by doing so can everyone get on the same page and move in the same direction. The most important thing is to begin implementation after determining the goals and objectives. In other words, day-to-day operations should aspire towards the same goal. The new government's "Action Plan" can be understood as a budget that gets approved and implemented each year. The government needs to plan the budget in accordance with the vision and long-term goals. However, such a political culture has not matured in this country, so money gets spend while the goals remain words on paper. The connection between projects and programmes being implemented with money from the budget and what exactly they are supposed to achieve tends to be uncertain. How can Mongolia develop when the budget's development process and adoption is so myopic and lacking in vision? This needs to change. Is the Long-term Concept of Sustainable Development being properly promoted and introduced to every Mongolian citizen, and uniting them towards the same direction? Is the annual action plan of Mongolia or the budget being directed towards achieving the goals and objectives? Are governmental authorities and all levels of organisations working in sync regarding the implementation of the concept? A "warden" to monitor and supervise its implementation is definitely required. Only by doing so will the concept avoid being left alone and failing like the previous experiences. Personally, I think that the newly established National Development Agency is this "warden." All in all, we now understand why Mongolia has not developed significantly and know that there must be a vision. The Long-term Concept of Sustainable Development has been developed and approved. Now we just need to implement it effectively. Ulaanbaatar, January 25 (MONTSAME) A team of researchers from the biopower plant of Novosibirsk, Russia, has worked in Zavkhan aimag of Mongolia. The team collected data from Ikh-Uul, Tosontsengel and Ider soums, where the largest number of yaks inhabit. With the collected data, the researchers are to prepare a complete study suggesting a solution to meet the heating and power demand of the province with biogas alternatives. Based on the study results, a project would be implemented in the Zavkhan province. The project will aim at reducing wood consumption for heat, and improving environmental protection in general. Although the first instalment of project investment is estimated to be a rather large amount, 85 percent of the investment can be settled through bank loan if the provincial administration would be willing to provide the 15 percent. If mobilized, the project would build model wintering places and townhouses powered by biogas. Ulaanbaatar, January 25 (MONTSAME) Mongolian NGO named 'Shine Mongol beleg' (literal meaning: New Mongolian gift) called for support of domestic production during Mongolian Tsagaan Sar (Lunar New Year) festival. Mongolian population is made of 816 thousand households. And a study conducted by the NGO suggests that there are about 100 thousand households which regularly prepare gifts for their guests during the national holiday. And on average, the study shows, one household spends about MNT 250-300 thousand on presents which indicate a total amount MNT 25-30 billion. "About 80 percent of the presents are goods imported from People's Republic of China", said M.Dorjdagva, Head of the NGO. "Some 30 domestic entities and more than 20 media outlets have agreed to cooperate on our project 'Let's choose Mongolian gifts' which involves free delivery of gifts by orders at 1900-2424 starting on February 1. The price rate of our gifts for delivery starts at MNT 2000", he said. M.Dorjdagva encouraged the Mongolian people to support domestic production by investing in their businesses for one of the biggest national festivals observed in Mongolia. Mongolian Tsagaan Sar or Lunar New Year celebration begins on Bituun or New Year's Eve when families prepare a great feast. Bituun means 'close down', a day when the moon can't be seen. As the sun rises the next day, the first day of another lunar year, celebration starts within every family with greetings. The greeting ceremony is later shared with extended family involving visits to each relative's family where presents are handed over to guests. Nationwide celebration of the year of the Rooster is set to begin on February 27, Monday this year. Ulaanbaatar, January 25 (MONTSAME) On January 25, the first meeting of the extended council under the Mayor of the capital city convened to discuss actions and works to be implemented in 2017. Mayor of the capital and Governor of Ulaanbaatar city S.Batbold released an ordinance to establish the extended council with composition of 25-30 people. The council, in charge of counseling on development principles of the capital, strategy, social and economic policies, is comprised of representatives from government and non-government organizations, scientists, businessmen and citizens. "-Previous council under the UB Governor consisted of few government officials. Involvement of representatives from different organizations and citizens, I expect, will positively influence to make proper effective decisions and to realize the decisions. The council will convene quarterly and counsel on already released and to be released decisions and ordinances of the Governor" said Mayor S.Batbold. During the meeting, action plan of the Governor in 2016-2020 and Guidelines on social and economic development in 2017 were introduced. Even though the country and the city face economic difficulties in 2017, the city authorities plan to continue infrastructure and construction projects and make investment targeted to well beings of the citizens. Within four years term a new children's hospital with capacity of 100 beds will be built and buildings for two district clinics and 10 health centers will be renovated. "BRT" project will start and 4 lines will be put into operation by 2019. Auto road with four lanes in route Ulaanbaatar-Choir and a new overpass will be built and three bridges will be renovated. Extensions for 31 school buildings will be made to change three shifts of classes. 'The biggest work to implement this year is to renew legal status of the capital. We have developed a bill on the legal status of the capital and submitted it to the Government. When its principal is approved, the bill will be submitted to the parliament" said Governor S.Batbold. Climate change has forced many Mongolian herders to abandon their nomadic ways and resettle in the country's capital. This brings environmental challenges for Ulaanbaatar - which one group is combating through mapping. January 25 (Deutsche Welle) Mongolia's capital city of Ulaanbaatar has its share of tourist attractions - Genghis Khan Square, the National Museum, the State Opera and Ballet Theatre. But Ger Community Mapping Center guide Tuguldur Chuluunbaatar wants to highlight a different part of the city; a part that's often ignored. "It's not like an entertainment or tourism tour," our guide Tuguldur Chuluunbaatar says. "It's more like giving people more realistic information about Ulaanbaatar, especially ger area." Gers, or yurts, are the traditional circular tent homes used throughout Mongolia. In recent years, desertification and harsh winters called "dzuds" in Mongolian have forced thousands of rural Mongolians to pack up their gers and head to Ulaanbaatar in search of work. But the steady influx of people has caused serious environmental problems for the city. Since new urban residents burn coal to heat their yurts, the air quality in Ulaanbaatar has gotten worse than Beijing or Mumbai. In 2016, a nongovernmental organization called the Ger Community Mapping Center started working to get a handle on these problems - through mapping. At the top of Dari Ekh hill, the scale of the ger district sprawl is staggering. A patchwork of white canvas gers, dirt roads and makeshift fences blankets the hills to the north and east of the city. And it's growing daily. Mongolia's advisor to the Ministry of the Environment, Batjargal Zamba, says many of Ulaanbaatar's environmental problems have to do with infrastructure that hasn't kept pace with the exploding population growth. "This city was designed for half a million people," Zamba says. But today, Ulaanbaatar has 1.2 to 1.3 million residents. More than 200,000 households make up the ger district - mostly people who've relocated to the city from the countryside. Recent data from the World Health Organization ranks air pollution in Ulaanbaatar as worse than Beijing and Mumbai. From 2009 to 2013, carbon dioxide emissions in Mongolia nearly tripled. And residents see it all around them, especially in winter. "When you are in the mountain or in a high place," Chuluunbaatar says, "there is like this dome over the city, this grey dome. Like a bowl upside down." Jargalsaikhan Erdene-Bayar lives with his wife, grandmother and three children in the heart of the ger district. After losing most of his livestock in a dzud, he quit herding and moved his family to Ulaanbaatar to find work. He wasn't alone. "During that time, so many nomadic families lost their livelihood. Thousands of livestock were killed. Because of that, they started moving. And it's still happening." Scientists say the increasing frequency of dzuds is at least in part due to climate change. Mongolia has seen a temperature rise of twice the global average. Together with factors such overgrazing, this has resulted in 70 percent of the country's grasslands being impacted by desertification. Erdene-Bayar makes decent money working construction most of the year. But come winter, he's forced to work as a security guard, earning just $140 (130 euros) a month. That's when he turns to burning coal to keep his family warm - 3 tons of it each winter. Erdene-Bayar knows it's dangerous to his family's health to burn coal. But he doesn't see another way. Mongolia has no natural gas reserves, and electricity is expensive. The stoves ger district families like his use are meant to burn wood and animal dung, not coal. Since the coal isn't fully combusted, it releases more particulates into the air. Erdene-Bayar says for conditions to improve, the government needs to move people like him into better housing connected to the city's central heating system. Ulaanbaatar did approve a master plan in 2013 to replace many gers with high-rise apartments for thousands of families. But progress has been slow, and many residents aren't willing to give up their traditional gers for walls of concrete and steel. Chuluunbaatar and Gongor of the mapping initiative say they're starting to see positive changes coming from their efforts. This year, they're mapping both the air pollution exposure of children during their commute to and from schools, as well as the overall air quality for the year in the city. Chuluunbaatar thinks that by educating ger district residents about what's happening in their communities, more change will come. "It's really hard to make the government or state do something when you're alone - but [through] the community, the voice is very strong." 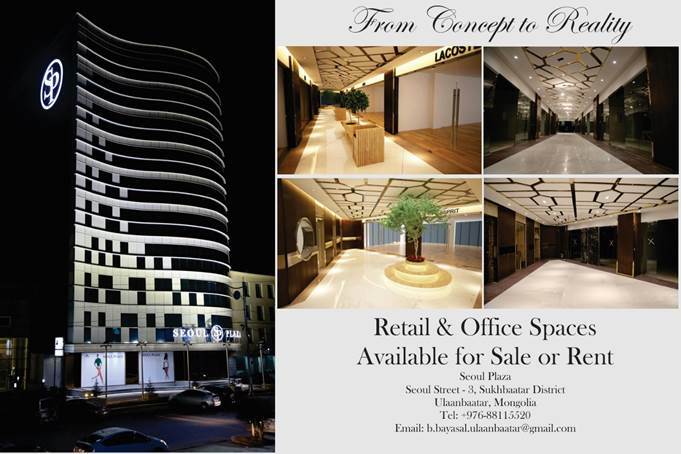 One ger subdistrict stands out in Ulaanbaatar. Green Lake once had the city's highest crime rate and worst access to clean water and education. Four years ago, local resident Ulziitogtoh Sodnomsente used his own money to transform the place. Now, he's collaborating with the Ger Community Mapping Center to add a small library and café to his park. "My main goal is to inspire young people to improve their living conditions and environment," Sodnomsente says. And that's what the Ger Community Mapping Center is all about, Gongor says. "Ulaanbaatar is our city," he says. "And to improve and develop it into a self-sufficient and eco-friendly city, every citizen needs to participate." Ulaanbaatar, capital city of Mongolia is home to almost half of the country's population, in which more than 60% live in the ger area. Centralized administrative power, rapid urbanization, economic and political instability calls for a stronger civil society with a vision for long-term, sustainable, and inclusive development. Ger Community Mapping Center sees community mapping as one of the tools to inform and empower local communities and the general public to promote participatory decision-making. Community mapping draws on the implicit knowledge within local communities on everyday issues with long-term consequences. She is a co-founder of Ger Community Mapping Center, a local NGO focusing on community mapping and participatory decision-making in Mongolia. Enkhtungalag holds a MA from University of Helsinki, Finland, and has worked with migrant and refugee youth. She also works at a local NGO providing services to children with disabilities in Mongolia, and hopes to improve services for vulnerable communities through community mapping. January 25 (UB Post) Day or night, Ulaanbaatar's roads are chaotic, noisy and clogged to breaking point. At 6:00 pm on a Thursday evening on Peace Avenue, traffic has come to a standstill for 30 minutes and the never-ending buzz of beeping horns echo through the city's streets. Ulaanbaatar's traffic nightmare is one of the most pressing issues for residents, second only to air pollution. Driving to the city from the outer districts can now take a painfully long two to three-hour journey. Elongated and unbearable traffic jams are causing headaches for drivers, pedestrians, public transport users and the government – and are even costing businesses money. Ulaanbaatar was originally built to handle 500,000 residents. Due to an increasing number of people moving from the countryside to the city, the population has swelled to 1.3 million, putting unprecedented pressure on the city's transport infrastructure. A 2015 report stated that the annual increase in motor vehicle numbers in Ulaanbaatar far exceeded the pace at which new, improved roads were being built, giving Ulaanbaatar "some of the worst traffic jams in the world". The population influx, poorly planned road network and traffic management issues are evidence of the wider problem: there are simply too many cars on the roads. One reason for this is that second-hand, hybrid vehicles from Japan are being imported at an unparalleled rate. In 2015, Mongolians imported 19,494 Toyota Prii (the official plural for Prius), which made up a staggering 52.5 percent of total vehicle imports. Because Mongolia charges no excise or air pollution tax on hybrids, the cars are very cheap – and old. Drivers can purchase a used hybrid 2000 model for as cheap as 2,000 USD, according to last year's statistics. Increased standards of living has allowed low to middle-income Mongolians to be able to afford a car of their own for the first time, resulting in a huge uptake of vehicle ownership, according to the American Chamber of Commerce in Mongolia (AmCham), an independent NGO working on traffic issues among other things. International examples show that a ban on cheap right-hand drive vehicles, such as the Toyota Prius, has helped manage the number of motor vehicles imported into a country and significantly reduced traffic congestion. While putting these vehicles out of reach for Mongolia's middle class is a controversial idea, limiting the number of vehicles on our already overwhelmed roads makes policy sense, and would hopefully encourage more people into alternative options such as using public transport or car-pooling. With Ulaanbaatar's population expected to reach two million by 2030, the strain on road infrastructure is only expected to worsen. On September 1, 2016, the government introduced a range of new laws aimed to crack down on congestion and increase safety. The new fines included: 19,200 MNT for driving too slowly and causing traffic congestion; 9,600 MNT for not making way for pedestrians at crossings; 19,200 MNT for using the opposing lane to overtake and 19,200 MNT for going through a red light. Since September, it was observed that many of these offences still occur on a frequent basis in the direct line of a traffic officer. AmCham Mongolia director of policy and advocacy O.Adiya said failing law enforcement is one of the reasons for bad driver habits and worsening congestion. "There's a weak enforcement in these laws. Traffic police sometimes act in a very discriminatory way and have double standards in fining people so there needs to be more strict enforcement," he said. The fines also need be increased to act as a real deterrent to drivers who blatantly break the rules. "Fines should be increased in such a way that the person feels this is really going to hit their pocket heavily. A 20,000 MNT fine is low, they think "I'll pay it", so fines should be increased," O.Adiya said. Better driver education on merging, overtaking, pulling off the road, parking and not using mobile phones while driving need to be at the heart of a public awareness campaign. Traffic officials have also introduced the points system for violations. Every driver starts with 10 points and loses points if they violate traffic regulations on top of fines. One of the reasons why roads are so clogged is that drivers have nowhere to park. Drivers park wherever they can: in driveways, on footpaths, in front of and behind other cars blocking them in, and on curbs. More paid parking and parking restrictions need to be introduced in the city. Parking in the city should not be free and parking inspectors need to routinely monitor parking sites and issue fines to illegally parked cars. "If you're driving and you're participating in the traffic problem, you should be paying for parking," O.Adiya said. "Many tend to park next to the building they're going to. Mongolians need to learn to park further away and walk – in big cities you have to comply with these rules, so for Mongolians, it's an attitude and behavior issue that needs to change." Multi-story car parks have not been nearly explored enough in Ulaanbaatar. Lined marking for parking would also improve traffic congestion as more cars can fit in the area provided. The government needs to prioritise parking solutions as a short-term solution to reduce congestion. The issue of public transport is multi-faceted. Due to the freezing weather and icy roads, alternative options that would work in other cities – such as riding a bike or walking – is not possible in the winter months. The proposed Ulaanbaatar metro railway, which was to be originally completed by 2020, was postponed in 2015. While a rapid rail service is desperately needed in the city, residents can only wait until the government solves its economic issues and finds enough capital to fund the project. To encourage public transport, the government should consider a "park-and-ride" system where large car parks, either permanent or temporary, are constructed on the urban fringe outside the city, which are connected by frequent and reliable bus services, with charges lower than parking in the city. More frequent bus services with express services in bus-only lanes need to be provided as a priority. Until better public transport options are provided, people will continue to drive and take up space on the roads. Cities such as Singapore and London have implemented a congestion charge for drivers wanting to enter the central part of the city in peak hours. The charge has collected large amounts of taxes for the local governments and drastically cut congestion. Ulaanbaatar could consider a similar proposal which could be used to fund better roads or public transport options. "One of the things that would help the government is to share international experiences and a traffic congestion tax is certainly an idea worth exploring," O.Adiya said. When the government introduced number plate restrictions on certain days, the plan was meant to reduce the number of cars on the road. However, the outcome resulted in more people buying a second car so they could continue to drive on off-days. The government must consider a better number plate restriction system on more cars to curtail the use of vehicles. Ulaanbaatar has a poorly planned road network. Adding more lanes will generate additional capacity along with building more interchange roads that have off-ramps, overpasses and under-passes which avoid bottlenecks in the worst congested areas. Figures from the Ulaanbaatar Traffic Control Center show there are more than 480,000 vehicles registered in Ulaanbaatar. But around 21,000 vehicles have never paid vehicle registration tax before. The Ulaanbaatar Traffic Police Department (UTPD) says it is monitoring vehicle tax collections closely and is planning to target drivers who evade their taxes. "All the cars in Mongolia have to pay vehicle registrations with funds meant to go to the Road Development Fund," O.Adiya said. "There is a total lack of transparency on this fund – they collect this huge amount of money but they don't say how it was used or what the money from the fund was used to achieve." Transparency in funds collected from issuing fines is also needed. While traffic police can issue on-the-spot fines, they are no longer able to accept payments on the spot from drivers. The move to only issue fine notices was introduced to stop bribery. Now, people have to go to the bank and pay their fine. For transparency, we need to see if it really is reducing bribery – and not just diverting it from the traffic police on the street to the coffers of government officials at the top. A 2015 report showed Mongolia may be the only country in the world that has a high proportion of right-hand drive (RHD) motor vehicles navigating uniformly right-lane-drive roadways, which leads to a very high incidence of head-on collisions on high- speed, two-lane roadways outside congested Ulaanbaatar. Even though Mongolia's roads were designed for left-hand drive vehicles, 65 percent of all registered vehicles are RHD, with 85 percent of all accidents involving one or more RHD vehicles. Due to RHD vehicles, many drivers have trouble overtaking and this is causing delays and confusion for drivers, and more widespread congestion issues. AmCham Mongolia is calling for a gradual ban on all RHD vehicles being imported into Mongolia. In the interim, AmCham believes the government should make ownership costs high for RHD cars by imposing a higher import tariff on every single RHD car being imported into Mongolia. January 25 (news.mn) The fourth trilateral meeting of the heads of state of Mongolia, the Russian Federation and the People's Republic of China is to be held this spring. It is Mongolia's turn to chair the summit, however, China and Russia have not yet agreed on the date. According to L.Purevsuren, Foreign Policy Advisor to the President, Mongolia is preparing to host the summit in Ulaanbaatar in May. The previous three summits were held during meetings of the Shanghai Cooperation Organization (SCO); the first in Dushanbe, the capital of Tajikistan in 2014 following by Ufa, Russia in 2015 and, most recently, in Tashkent, Uzbekistan in 2016. The next meeting of the SCO is scheduled to take place in Astana, the capital city of Kazakhstan. Last year, a trilateral economic partnership agreement was signed by presidents Ts.Elbegdorj of Mongolia, Xi Jinping of China and Vladimir Putin of Russia in Tashkent. The agreement consists of 32 proposed projects, and outlines the creation of a joint investment centre to assess the financial requirements and feasibility of each by the end of 2016. January 25 (gogo.mn) Mr.Tsend Munkh-Orgil, Minister for Foreign Affairs of Mongolia, talked on the phone with Mr.Wang Yi, Minister for Foreign Affairs of the People's Republic of China on 24 January 2017. Minister Ts.Munkh-Orgil confirmed Mongolia's steadfast adherence to the "One China" policy and its long-standing position of regarding Tibet as an inseparable part of China and all Tibet-related issues as internal affairs of China. He also noted that mutual respect for each other's core interests was a fundamental principle for the development of bilateral relations between the two countries. He went on to express his government's regrets that the Dalai Lama's visit to Mongolia at the invitation of the Gandantegchenlin monastery had adversely impacted friendly relations between Mongolia and the People's Republic of China. On the issues of the Dalai Lama's visit to Mongolia and identification of the 10thBogdo Jebtsundamba, he reconfirmed the Government of Mongolia's position made public earlier in the Mongolian press, and emphasized the priority importance the Mongolian side attached to the promotion of friendly relations and cooperation with the People's Republic of China. Foreign Minister Wang Yi noted that the sustainable development of Chinese-Mongolian relations were in the core interests of the two countries and their people. He further said that the Chinese side took note of the Mongolian government's position made public earlier in the press, including the Government of Mongolia's assurance that the Dalai Lama would not be allowed to visit Mongolia during its term in office. He went on to express his appreciation for the constructive efforts undertaken by the Mongolian side to respect the core interests of China and mitigate the adverse impact in Chinese-Mongolian relations in order to further develop relations between the two countries. The Foreign Ministers concluded the talk by reaffirming their joint commitment to exert further common efforts to continue to develop mutually beneficial cooperation between the two countries in the spirit of Mongolia-Chinese comprehensive strategic partnership. January 25 (news.mn) The Mongolian Armed Forces are hosting a joint military exercise entitled 'Peace Winter-17' with the United States Special Operations Command Pacific (SOCPAC) for the first time. The opening ceremony of the joint exercise was held at the 311st Unit of the Mongolian Armed Forces on 23rd of January. Her Excellency, Jennifer Zimdahl Galt, U.S. Ambassador to Mongolia, Brigadier-General J.Badambazar, deputy head of the General Staff of the Mongolian Armed Forces, General G.Saikhanbayar, director of the strategy and policy planning authority at the Ministry of Defence and other officials participated in the event. Soldiers from 150th, 330th and 350th units of the Mongolian Armed Forces are taking part in the joint exercise. Ulaanbaatar, January 25 (MONTSAME) J.Ganbaatar, Member of Parliament and head of Parliamentary Deputy Committee on SMEs Development met with Ivana Grollova, Ambassador Extraordinary and Plenipotentiary of the Republic of Czech to Mongolia on Monday, January 23. At the beginning of the meeting, the Parliament Member remarked, "Small and Medium-sized Enterprises or SMEs are the driving force of any economy, and the Republic of Czech demonstrates it. Therefore, we'd like to learn from your experiences, link our corresponding organizations in charge of SMEs, and organize productive events". For her part, the Ambassador touched upon bilateral ties which are 'at a high level', and said, "We have experience in implementing SMEs-oriented projects and programs especially in agriculture". "We will review your proposal, and be focusing on cooperation, and connecting small and medium-sized businesses of the two countries", Ambassador Grollova said. January 25 (gogo.mn) The President of Mongolia Ts.Elbegdorj has attended the 47th annual meeting of the World Economic Forum which was held in Davos-Klosters, Switzerland. This year's meeting attracted Heads of State and Government of over 80 different countries, high-level delegations and more than 2600 representatives from international organizations, private sector and civic society. At the World Economic Forum, the world's leaders have discussed the most pressing global challenges and share their views under the theme "Responsive and Responsible Leadership". President Elbegdorj has participated in the following sessions to express Mongolia's position and exchange views. Implementing the 2030 Agenda for Sustainable Development Through Strengthening Cooperation: The Leading Role of Mining Sector. On Jan 18th, the President of Mongolia participated in the Informal Gathering of World Economic Leaders themed "The top priorities of the USA's next administration". At the meeting, they discussed issues related to security, economic and investment policies of the President-elect Donald Trump, as well as the first 100 days of his presidency and exchanged views on the next top priorities of the White House. Then, President Elbegdorj participated in the session themed "Regional Transformational Power Projects". At the session, the world leaders discussed the Asian Super Network project and the implementation of the regional energy projects and its risks. Later in the day, the President of Mongolia participated in the session themed "Strengthening Trust Through Leadership", where he shared views on the anti-corruption policies in the world infrastructure projects, openness and transparency and enhancing the good governance. On Jan 19th, President Elbegdorj participated in the Informal Gathering of World Economic Leaders /IGWEL/ on the theme "Responsive and Responsible Leadership in a Multi-polar World". Leaders discussed the world's top cooperation priorities of 2017, the most important issues that the UN Secretary General needs to pay attention, new policies and decisions of the White House and strengthening a responsible leadership in the today's society where the people's trust in the government has fallen and the rising populism. After, the President of Mongolia attended the discussion themed "Implementing the 2030 Agenda for Sustainable Development Through Strengthening Cooperation: The Leading Role of Mining Sector. Mining sector can help implement the Sustainable Development Goals adopted by the UN General Assembly and therefore, the world leaders accurately discussed this issue. Afterwards, President Elbegdorj participated in the discussion on water security. During the discussion, the parties exchanged views on using the experiences and recommendations of the 2030 Water Resources Group to implement the Sustainable Development Goals. The 2030 Water Resources Group was launched in 2008 at the World Economic Forum and it has attracted over 400 partner organizations from over 10 countries. These partner organizations are committed to redefine the world's water policies and they aim to contribute to the coordinated effort to achieve the United Nations' Sustainable Development Goals of ending extreme poverty; growing strong, inclusive, and transformative economies; and protecting our ecosystems. On Jan 20th, the President of Mongolia Ts.Elbegdorj participated in the session themed "the Silk Road Effect". At the session, the parties discussed political and financing issues of the new Silk Road project which connects Asia and Europe and shared their thoughts on the future impacts of the project to the regional integrity. Moreover, he noted: "In 2016, I had a trilateral meeting with the President of Russia Vladimir Putin and the President of China Xi Jinping, where we signed an important agreement on creating economic corridor between the three countries. As you know, Mongolia is located between these two big countries. Mongolia has vast territory of 1.5 million square kilometers and ranks among the top 10 resource-rich nations in the world. Following, the President of Mongolia participated in the discussion on air pollution. The world leaders discussed opportunities for using modern technology to combat air pollution, to protect human health implementing long-term policy, to develop agriculture and to fight climate change. Moreover, the President of Mongolia took part in the Informal Gathering of World Economic Leaders themed the "Fourth Industrial Revolution". At the session, parties touched upon the issues related to using environmentally friendly technology, enhancing the collaboration between the government and the private sector in this field and implementing new standards and rules. January 25 (China Development Agenda) The People's Republic of China, Mongolia and Russia (here referred to as the three party) commit to further developing the already friendly ties, while seeking to build mutually beneficial economic and trade relations in line with the strategic direction of the diplomatic policies between the three parties. In accordance with the memorandum related to the establishment of the China-Mongolia-Russia economic corridor, the construction of the New Silk Road, the common goals of mutual benefit and cooperation expressed in the memorandum of understanding signed in Wufa on the 9th of July 2015, the three parties herby sign the following plan outline for the establishment of the above mentioned economic corridor. The construction of the economic corridor is aimed at enhancing the already existing trade between the three parties, promote product competitive power, improving the transportation routes between these countries and infrastructure construction. The goal is to go a step further in the cooperation between the China, Mongolia and Russia. The construction and expansion of the economic corridor has the goals of mutually benefit the economic development of these areas, develop the three parties' potential and superiority, promote mutual prosperity and improve, as allies, the competitive power on the international markets. The three parties firmly believe that moving forward with the construction of the economic corridor will accelerate the economic integration of this area and the linkup of each party's development strategies. Furthermore, the interflow of infrastructures, the steady development of investments, the cooperation on economic policies and the cultural exchange create a solid base of cooperation. The three parties have to positively use the platform of international economic cooperation to successfully implement the condition of the cooperation. This shell be done through railway, aviation, harbours and ports, as well as parallel strengthening of the cooperation in international transportation corridors, border infrastructures and cross-boundary transportation organizations, in order to form a long-term communication mechanism to promote interconnection and development of transit transportations between China Russia, Asia and Europe. Development of China-Mongolia-Russia international container transport classes and the construction of a number of transport logistics hub. Strengthen the capacity of software and hardware at the port, promote the renovation and transformation of infrastructure, enhance the level of prevention and control of public health at ports. Moreover, strengthen information exchange and mutual assistance in law enforcement. Further improvement of the models and mechanisms for customhouses, medical inspection, quarantine and cargo supervision, and jointly promote the passage of goods to improve the capacity of ports. Strengthen the co-ordination and full exchange and sharing of experiences and practices between the three parties' authenticated managers. Strengthen the cooperation in cross-border surveillance and control of infectious diseases, vector surveillance, disposal of public health emergencies and other aspects of this field. Strengthen the cooperation of the three parties in energy and mineral resources, high-tech, manufacturing and agriculture, forestry, animal husbandry and other areas, and build investment cooperation to achieve coordinated industrial development, as well as the formation of a closely linked regional production network. Rely on the civil aerospace infrastructures, develop a three-party satellite, expand information exchange and cooperation. Develop border trade, optimize the structure of commodity trade, expand the volume of trade in services, expand economic and trade cooperation and enhance the level of economic and trade cooperation. Guide the cross-border trade towards process, investment and trade integration. The focus will be on deepening cooperation in the fields of education, science and technology, culture, tourism, health and intellectual property rights, facilitate personnel exchanges and expand non-governmental exchanges. Exchanges and cooperation in the fields of drama, music and acrobatics, film, folk creation, cultural heritage protection, library affairs and culture, with the aim of creating cultural exchange brands and expanding creative links. Study the possibility of establishing an information sharing platform and cooperate in the areas of biodiversity, nature reserves, wetland protection, forest fire prevention and desertification. Co-sponsoring environmental seminars to explore possibilities for cooperation in research. Develop comparative advantages of the three countries, promote the construction of cooperation mechanisms, such as promoting the eastern part of Mongolia and the relevant regional cooperation mechanism in both Chinese and Russian areas. Carry out research within specific geographical areas pre-decided by the three parties, according with the framework of the initiative. The investments involving the project will be implemented on a case-by-case basis, they will include the use of national investment, private sector investment, the introduction of public-private partnerships and other possibilities such as the inclusion, not exclusive, of the Asian Infrastructure Investment Bank, the BRIC Development Bank, the Shanghai Cooperation Organisation Bank Consortium, the Silk Road Fund, and other financial institutions willing to support the financing. Russian Federation – Ministry of Economic Development of the Russian Federation. The Tripartite Authorized Implementing Authority shall meet at least once a year to monitor the planning and implementation of the project and to negotiate the necessary measures for its further implementation. The three parties will also study the possibility of setting up an investment project centre and will build the centre if it is economically viable. This project is not an international treaty, it does not produce rights and obligations under the international law. The rights and obligations of the three parties under international treaties are beyond the scope of this project. This plan is effective from the date of signing and is valid for five years. Before the end of the effective period of this plan, the three parties will carry out a joint assessment of the implementation and extend the validity period to the next five years according to the assessment results and mutual agreement. This plan was signed in Tshkan on the 23 June 2016 by Chinese, Mongolian and Russian signatures, each of which is equally authentic. Ulaanbaatar, January 25 (MONTSAME) On January 24, A.Tsogtsetseg, Minister of Health met with delegates headed by Ayumi Konishi, Director General for East Asian Department at the Asian Development Bank and exchanged views on works to be co-implemented. Underlining that Mongolia appreciates the contribution of the ADB for the development of Mongolian health sector, Minister A.Tsogtsetseg noted that ADB's project of Development Program of Health Sector has been realized in Mongolia since 1997 and a number of health projects are currently being implemented with grant aid and soft loan of the ADB. Most recently, the National Blood Center of Mongolia has renovated its office and blood banks were established at the center with the support from ADB. The Government of Mongolia and the Ministry of Health had discussed about ADB's projects to implement in Mongolia 2017-2020 and Mongolia had rendered proposols on two health projects to ADB in December 2016. In this regard, the Health Minsiter requested the ADB to support on the proposals by Mongolia. In response, Ayumi Konishi expressed his gratitude to the Health Minister for cooperating with Mongolia in the health sector and said that the ADB is planning to give financing of USD 300 million each year in the next 4 years, half of which, will be provided to the health industry of Mongolia. "The ADB has a willigness to cooperate with Mongolia on the delivery of social welfare to target groups and combating air pollution". Furthermore, he added that Mongolia needs to increase the number of ambulances in the rural areas and expedient distribution is important in optimizing the efficiency of health care. In turn, A.Tsogtsetseg informed that the Health Ministry of Mongolia is working to estimate and re-distribute the medical equipment in the provincial areas and that ambulances in 60 percent of all soums will be revamped. Ulaanbaatar, January 25 (MONTSAME) Mongolian embroiderers and officials from the Bogd Khan Palace Museum and Cultural Heritage Center announced on January 25 that a Mongolian pouch crafting would be registered into the Intangible Cultural Heritage of Humanity of UNESCO. S.Gantsetseg, Executive Director of "Egneshgui sanaa" NGO (literal meaning Unique Initiatives) informed on the press conference held today, "We sent our request to register the Mongolian pouch crafting into the Intangible Cultural Heritage of Humanity of UNESCO in 2010". To accelerate the matter, a replica of Bogd Khaan's pouch will be nominated to the Guinness book. The crafting process of the pouch will start during the opening ceremony of the "Embroidery art wonder" exhibition, which will take place at the Bogd Khaan Palace Museum on January 27. The duplicate of the Bogd Khaan's pouch will be crafted as 225cmx88cm four times bigger than the actual size of original pouch of Bogd Khaan. It will be nominated for "the biggest pouch crafted by the most number of people" in the Guiness records. The exhibition will display the best of modern day embroidery works and rare collections of Bogd Khaan Palace Museum to the public, including the original pouch of Bogd Khaan. Ulaanbaatar, January 25 (MONTSAME) In January 2016, the International Red Cross and Red Crescent Movement" began a program to assist herders to overcome difficulties of dzud. The program was set to take effect for 12 months. With the deadline set on February 28, 2017, the program has donated CHF 847 thousand for Mongolian herders. The early estimation says the assistance to herders totaled CHF 979,346 within the program, which is nearly finished, executing 87 percent of its projected humanitarian aids. The remaining CHF 132 thousand will be provided to herders by February 28, wrapping up the program altogether. According to the web page of the Red Cross Society", the aid was provided to 32 thousand herders of 5500 households in 17 aimags of Mongolia. January 25 (Royal Veterinary College) A Royal Veterinary College (RVC) expert is in Mongolia to join a crisis management mission in response to critically endangered saiga antelope dying off in the country. Some 1052 Saiga tatarica mongolica – a critically endangered sub-species of saiga – have been found dead in Mongolia's western Khovd province over a third of the range so far, out of a total population of around 10,000. Mortalities are expected to be higher by the end of the epidemic. Samples taken from carcasses were positive for peste des petits ruminants (PPR) infection, a lethal viral disease with plague-like impact on domestic herds. It can kill up to 90% of animals it infects. This wildlife mortality follows an outbreak of this emerging disease in Mongolia for the first time ever in sheep and goats in September 2016 in Khovd. Despite mass vaccination it seems the virus is still active and could have devastating impacts on this largely nomadic pastoral society and the rich wildlife species which are susceptible. This event follows another devastating mass mortality of some 220,000 saiga in Kazakhstan in 2015 which attracted global attention. Richard Kock, Professor of Wildlife Health and Emerging Diseases at the RVC, has expertise in veterinary epidemiology, ecosystems health and vaccinology. The Crisis Management Committee mission he has joined is a joint United Nations Food and Agriculture Organization and World Organisation for Animal Health (OIE) initiative. Professor Kock is visiting the affected area and will provide feedback to the Mongolian government and international community. Along with the rest of the Crisis Management Committee, he will advise on what can be done to reduce the disease impact on the saiga. The Committee will provide technical expertise to support Mongolian officials in their investigation of PPR among wild animals and its potential impact on the current PPR situation in livestock. The team intends to identify any interactions between wildlife populations with food production animals relative to the risk of introduction and spread of PPR. Professor Kock and the team will support Mongolian officials in their assessment of the epidemiological situation and outbreak investigation methods. They will also help local officials coordinate with other sectors to investigate the suspected PPR morbidity and mortality events in Mongolian wildlife species. The Committee will support the Mongolian veterinary services to ensure the diagnostic material available is sent to the Global Reference Laboratory for PPR, which is at Pirbright Institute in the UK, and to CIRAD in France for confirmation of the viral diagnosis. Commenting on the situation in Mongolia, Professor Kock said: "Critical communication efforts must be made to let Mongolian herders know the risks of the PPR virus spilling between saiga and livestock. We are still unravelling these devastating outbreaks in Kazakhstan and we have learned that these events are requiring a particularly high level of international cooperation and inclusion of the FAO OIE and world reference laboratories to ensure full understanding of the epidemiology." The FAO's Chief Veterinary Officer Dr Juan Lubroth has underlined that a regional strategy to contain and eradicate PPR needs to implemented and resources made available to prevent further spread of the virus in Mongolia, as well as in Kazakhstan and China where outbreaks were first reported in recent years. The FAO and the OIE are leading a multinational effort to eradicate PPR, which can have devastating food-security and economic impacts, by 2030. 80% of the world's estimated 2.1 billion small ruminants live in affected regions and constitute an important asset for a third of poor rural households in developing countries. PPR, first identified in Côte d'Ivoire in the 1940s, is now reported in over 75 countries. While wildlife have long been considered potentially vulnerable to the virus, relatively few actual cases of PPR infection have been documented, and never in free-ranging antelope. The dead saiga are highly suggestive that there was a spillover of virus from domestic animals, which were affected by PPR in the summer of 2016. 11 million vaccines were applied to control the spread of the disease, which had been reported in the country for the first time. Saiga and small livestock share common grazing areas as livestock systems are based on traditional nomadic pastoralism. Efforts are ongoing to investigate the situation on the ground, geared in particular to collecting more diagnostic materials and conducting additional tests to investigate possible other causes, including the bacterial infection Pasteurella multocida, which was the proximate cause of death of hundreds of thousands of saiga in Kazakhstan in 2015. RVC scientists and collaborators are undertaking ongoing investigations of that mass mortality. Scientists are looking for underlying triggers, including viruses, climate and other factors to explain this extraordinary event where over 90% of the population died over a few weeks, affecting some 220,000 animals spread over an area the size of England. Saiga in Mongolia are not truly migratory like their cousins in Kazakhstan but are nomadic with an extensive range of about 13,000 km2, with seasonal movements in autumn for breeding and spring for calving. Other wild species at risk include the goitered and Mongolian gazelle, mountain ibex and Bactrian camel. January 25 (MONTSAME) Over 70 million-year-old dinosaur fossils returned to Mongolia in the spring of 2013, after the President of Mongolia took actions on the alleged report that the Tyrannosaurus Bataar fossils that had been found in Mongolia were to be sold for USD 1.085 million at an auction in the US. With the help of an international court, Mongolia received its rare finding of Tyrannosaurus Bataar fossils and displayed in a special facility at the Central square of Ulaanbaatar city for the public. This event was the start of the establishment of the Museum of Mongolian Dinosaurs, which was then put into operation by the autumn of 2013. The Central Museum of Mongolian Dinosaurs, located in the Chingeltei District of Ulaanbaatar city, is aimed at protecting and preserving findings of dinosaurs, displaying them to the public and passing those heritages down to the next generations. The Museum is also working to seek for any dinosaur fossils initially found in Mongolia and to register the rare items and create a database. The museum accommodates many types of interesting paleontological findings, dinosaur fossils and eggs such as Tarbosaurus bataar, Saurolophus, Oviraptorosauria, Ankylosauridae, Protoceratops, Ornithomimosauria, Prenocephale, Lycoptera, Conchostrace and Ephemeroptera. Ulaanbaatar, January 25 (MONTSAME) "Beauty of Mongolia and its features" photo contest among amateur photographers has announced its best photos. 12 amateur photographers took part in the contest with their 12 photos and a photo by G.Munkh-Od, which depicted 'Hun chuluu (Kurgan stele)' in Khovd aimag won the first place. Photos Sea shore" by B.Ulsbold, and 'On the way to Ushir waterfall' by L.Janchivdorj, which ilustrated the shore of Khuvsgul Lake as well as Ushir Waterfall located in Bayanzurkh soum of Khuvsgul aimag respectively, won the second and third places. The photo contest was organized in the framework of the third international conference "Considering natural conditions and territorial features in the social and economic development". The Ministry of Environment and Tourism granted certificates and prizes to the winners. January 24 (The Gannon Knight) Gannon University hosted two environmental speakers who discussed the conservation of reindeer and how students can get involved in this action Monday. The lecture tied into the theme of culture and climate change, which Gannon is focusing on this year. The speakers included Gregory L. Finstad, Ph.D., an associate professor with the School of Natural Resources and Extension at the University of Alaska Fairbanks, and Sophia Papageorgiou, DVM, Ph.D., who attended Tufts University School of Veterinary Medicine and studied wildlife and international conservation medicine. Walter Iwanenko, Ph.D., Gannon's vice president of academic affairs, opened the lecture by saying that the speakers would discuss the effect of climate change in Alaska and how these changes are affecting the reindeer in the area. Before the discussion began, Finstad said that there is a possible relationship between Gannon and the University of Alaska Fairbanks that is being explored. This relationship would allow for further research to be completed about the consequences of climate change. He also mentioned the possibility of an internship becoming available for students. Finstad said that the field work is difficult, but makes for an "exceptional experience." Cheyenne Barger, a sophomore biology major, said that she believed this lecture was necessary to influence students to recognize a problem and make a change. "I thought that this was an important event to be held at Gannon because of the university's current focus on the effects of climate change all over the world, and how we can try to help combat climate change right here in Erie," Barger said. Finstad began by saying that reindeer are a prime source for the Alaskan people. He said that people have depended on the animals for as long as they have been living in the North. Finstad also said that reindeer were made in order for humans to use them to meet their own needs. The Alaskan people use every piece of the reindeer for meat, fur and even as a method of transportation. This is why Finstad said these animals – and the conservation of them – are so important. He went on to say that reindeer make research possible in areas such as climate, culture and education, and that this research is important because of the major effect it has on humans. "People's lives depend on this," he said. Finstad runs the Reindeer Research Program, where they have set aside land in Western Alaska for reindeer grazing. They have also developed an animal location system that uses collars on reindeer that ultimately benefits herders. Papageorgiou discussed work that she had completed in Mongolia that led to her concerns surrounding climate change. She said that during her time studying reindeer in Mongolia, she noticed that the animals were contracting diseases that should not have been possible given their environment. These diseases were only possible due to the changing climate. She said that the effects of the climate on the reindeer went on to affect the people who depend on these animals in order to survive. The lack of healthy reindeer would result in the lack of milk, meat and fiber. Barger said that Papageorgiou's experiences stuck with her after the lecture. "The most interesting part of the lecture was when Dr. Papageorgiou talked about her experiences researching the reindeer in Mongolia, and saw that climate change affects everyone, even those who do nothing to contribute to it," Barger said. January 25 (CNN)After almost two decades of foreigners dominating its most iconic sport, Japan has a homegrown sumo champion again. On Wednesday the Japan Sumo Association conferred on 30-year-old Kisenosato the sport's highest rank, yokozuna, making him the 72nd Grand Champion and the first Japanese wrestler to gain the title since Wakanohana in 1998. "I accept with all humility," Kisenosato said at a ceremony to mark his promotion. "I will devote myself to the role and try not to disgrace the title of yokozuna." Professional sumo consists of 10 levels, from jonokuchi to yokozuna, with wrestlers rising through the ranks as they rack up tournament wins. After being promoted to ozeki, the second-highest rank, sumo wrestlers must win two consecutive tournaments or post an equivalent record of wins. After that, a judging body decides whether the wrestler has demonstrated the "correct character, poise and dignity." Among the more than 600 professional sumo wrestlers, there are currently less than four yokozuna, according to NHK. Kisenosato's promotion comes after winning the new year tournament with a record of 14 victories and one defeat. The 175 kilogram (385 lb) Kisenosato, real name Yutaka Hagiwara, has been competing since 2002, reaching the rank of ozeki in five years ago. Traditionally dominated by Japanese sportsmen, foreign born sumo wrestlers have outshone their local rivals in recent years. At home, the sport has faced competition from more popular foreign imports like baseball and soccer, and been rocked by corruption and match fixing allegations. Last year, 15 of the 42 wrestlers in the top division were from outside Japan, according to NHK. Wrestlers from Hawaii, Samoa and in particular Mongolia, where a traditional form of wrestling similar to sumo is practiced, have proliferated. "Mongolians are simply hungrier to win in sumo. In Japan, sumo wrestlers, even champions, aren't particularly rich by national standards," expert Taylor Weidman told CNN last year. "In Mongolia, though, the same salaries seem much bigger. Sumo champions are also incredibly famous in Mongolia, and former champions have parlayed their sumo careers into careers in politics and business." There are 23 Mongolian wrestlers currently competing at all levels of professional sumo. Ulaanbaatar, January 25 (MONTSAME) Pianist B.Bat-Erdene will play at the Philharmonic of Republic of Buryatia, Russian Federation on February 01. B.Bat-Erdene, born in 1990, graduated from the Music and Dance College in 2008 and studied at the UWC Adriatic College in Italy. Afterwards, he graduated from the Trieste Music Conservatory of Italy with high success and entered to the Udine Conservatory for a master's degree under the leadership of Massimiliano Ferrati. B.Bat-Erdene was the first winner of 'Chopin and 21th century' contest organized in Mongolia in 2010. Moreover, he won in several other competitions, including 'Milosz Magin' in France in 2011 and 'Villa de Madrid" in Spain in 2013. He was also entitled to play in 'La Fenice' theatre of Venice, winning the 4th place in 'Premio Venezia' competition for graduates in Italy in October 2014. The Mongolian contortionist travels with a circus and has high hopes of squeezing herself into impossible places for as long as she can. January 25 (Daily Record) Odka was just 11 years old when she decided she wanted to squeeze her body into improbably tiny places for a living. Growing up in Ulan Bator, the capital of Mongolia, this was not as nuts a career ambition as it might have been for a girl in Ullapool or Bishopbriggs. The huge landlocked country between Russia and China has a long history of producing acrobats and contortionists. Circuses all over the world have Mongolians defying all expectations of how a human body can bend. Odka – her surname got lost in the bottom of a big top somewhere – also has an aunt, Ione, in the business. She encouraged her niece and got her started in the rigorous training required to make her body as mouldable as Plasticine. "At first the practice was basic, not too much," Odka said in her creaky English. "I was slow, slow at getting better. I trained after school every day. Six days a week I was training." Her aunt encouraged her all the way and the training became more advanced. Odka's English does not cover the terrifying positions she practises on a daily basis but they include standing splits and contortion handstands. And they all require the flexibility of an elastic band combined with the muscles of an athlete. Plus balance and the patience to do them over and over again, getting a little further every time. Basically, it's advanced Pilates meets origami for the human body. Odka was 15 when she left home for a three-month stint with a circus in Turkey. She worked through the summer holidays. If jobs coincided with term time, a teacher came with her. Life was training, rehearsals, lessons. "In the beginning it was a little bit difficult," she recalled. "I missed my parents. "Now it's OK. I enjoy going to different cities, I like my job." These days Odka is part of Cirque Berserk, a travelling troupe who bring the thrills and skills of the big top to theatres. Her act is in two parts. First, she folds herself into a bottle. It's the kind of flagon that Uncle Terry used for making homebrew in the shed … with a door cut in the front. Somehow she doubles her limbs on top of themselves, slides in her head and shuts the door. Getting out again looks even harder – although she does it with huge poise and grace, while wearing enormous false eyelashes. For her next trick, she shoots a bow and arrow. With her feet. And hits the target. She said: "I try every year to make sure something changes in my act, to make something different. "I'm trying a hula hoop just now. I'm not sure about it yet." Odka is 22 and has been contorting herself for half her life. She reckons that, as long as she keeps up with her chest stands and splits, she has plenty of time left. After all, her aunt and mentor is still as bendy as ever. Odka said: "Ione is 35. She can still get into a bottle." January 25 (D'Marge) Winter is a time of hibernation for many. When the season arrives, the less hardy among us retreat to their homes for warm beverages and Netflix binges. But for the rest of us, the cooler climate brings its own kind of adventure, and it's prime time to explore places all around the world that shine their brightest when the mercury drops. Whether you're looking to flee the snow or fly headfirst into it, this dazzling planet of ours offers a destination for every kind of cold weather traveller. Find yours here, in the D'Marge guide to the best places to visit in winter. It may be a desert, but there's nothing warm about it in winter. Most travellers choose summer to explore the vast landscapes and nomadic cultures of Mongolia's Gobi Desert, but more intrepid adventurers brave winter's below-freezing temperatures to experience a different side of the wild terrain. Come during the Thousand Camel Festival to witness races and polo competitions in which participants compete atop endangered Bactrian camels, as well as performances of traditional Mongolian music and dance. January 25 (The Copenhagen Post) Back in 2002, one Dane's very personal pilgrimage to Afghanistan made for stirring news. Søren Haslund-Christensen, the marshal of the Danish Royal Court, travelled to the volatile region documented by his son, film producer Michael, in a bid to see the grave of his father, explorer and ethnographer Henning Haslund-Christensen, who died in Kabul in 1948 and was buried in the city's only Christian cemetery. Until 2003, Søren Haslund-Christensen made his living as a prominent man whose attention to detail and protocol required a subdued presence: the eternal organiser and right-hand man of the queen, devoted to the service of this country's much-loved Royal Family. For Haslund-Christensen, as he told Berlingske Tidende back in 2002, the journey to Afghanistan was an intensely personal experience – more so because he was able to share it with his son. The court marshal visited the cemetery for the first time in April – the very first opportunity afforded him after 23 years of crippling war in Afghanistan. For his first visit, Haslund-Christensen commissioned a new headstone for the grave, reading simply: "The Danish explorer Henning Haslund-Christensen, 1896-1948." At the time of his death in 1948, Henning Haslund-Christensen represented the adventurous dream of many a Danish child. His books, radio lectures, and articles chiefly documented his adventures in Mongolia and brought him great renown in this country, though he failed to achieve the iconic status of someone like Knud Rasmussen. Haslund-Christensen was no Indiana Jones: he was an inquisitive, self-taught researcher who optimised his expeditions by using the cream of the world's crop of scientific luminaries and favouring far-flung destinations. The purpose of Haslund-Christensen's journeys was to document indigenous ways of life before the encroachment of other, modern civilisations. The head of the ethnographic department of the National Museum, Kaj Birket-Smith, told Berlingske Tidende: "After the death of Knud Rasmussen, Haslund-Christensen was the one person who contributed the most to the growth of the ethnographic collection here at the Naitonal Museum." The explorer died in 1948 in Afghanistan, acting as leader of the Danish Central Asian Expedition, after reportedly suffering a heart attack due to overexertion while mountain climbing. The sudden death came as a shock to his then 15-year-old son Søren. "I remember I was going to school at Herlufsholm when I was suddenly called to Copenhagen. I had a feeling that something was wrong. My suspicions were confirmed as I crossed the Town Hall Square and looked up at the Politiken billboard to see the news that my father was dead up in lights," Haslund-Christensen recalled. The death of the noted explorer in a far-off place made it particularly hard for his son to deal with, though Søren Haslund-Christensen learned not to dwell on his father's frequent, extended absences from the family during his many expeditions. "Of course my father was away for long periods of time. But he was always with the family very strongly in spirit … I used to get a flood of questions in school about my father, which always irritated me to no end. But he was also a man who came into people's living rooms – he was one of the first people to hold lectures broadcast on the radio, using recordings from the far-off places he visited," Haslund-Christensen told Berlingske Tidende. Søren Haslund-Christensen owns a wealth of archival material and memorabilia about his father and his first book on his father, 'The Man in Mongolia,' was issued in 2002. Søren Haslund-Christensen has also done his part to contribute to the rehabilitation of the country his father died exploring. He was a former member of the Danish Afghanistan Committee, which operated hospitals and clinics in the country.